You know you have really great people in your life when you get a call that goes like this: “Therese, my 13-year-old son’s good friend was just diagnosed with type 1 diabetes. Can you help me understand this disease and what I can offer the family to help them through this difficult time?” She said she thought about giving them a cookbook. This is the typical gift that someone buys for a family with a newly diagnosed child. Because they often don’t understand diabetes and, honestly, no one truly does unless they or their child has it. It’s a chronic illness that is complicated, challenging, confusing, doesn’t obey by the rules, has no rhyme-or-reason and is very difficult to grasp. 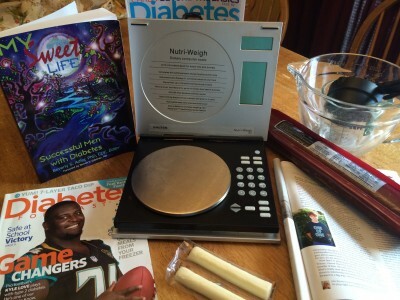 A diabetes cookbook is a thoughtful gift, but maybe more so for someone with type 2 diabetes. Diet and exercise can help reverse the effects of type 2. This isn’t the case for type 1 diabetes, as it’s an autoimmune disease which destroys the beta cells in the pancreas that produce insulin. I started thinking about what a thoughtful gift would be for someone recently diagnosed with diabetes and went right to the source for some suggestions: one of my favorite type 1 diabetes parenting groups within the diabetes online community on Facebook. A food scale that has different modes, like weight in grams for carbohydrate counting. These can be expensive, so maybe go in on it with another family. Depending on the age of the child, a teddy bear to hug while getting those first pokes. Different, fun measuring cups to measure everything that the child eats now. Candy and juice pouches for low blood sugars. Choose sugary-type candy over chocolate, because chocolate is higher in fat and can take longer to raise blood sugar levels. 15-gram carb snacks like granola bars. This amount is important, because it’s the size of snack that most endocrinologists let the kids have during the first months of diagnosis. Small (purse-size) notebook or journal for keeping track of blood sugar numbers or information that you don’t want to forget. Remember we are sleep deprived! A calculator (most phones already have them) for counting carbs and insulin doses. A book like Dr. Beverly Adler’s “My Sweet Life” series, which is about successful women and men with diabetes. The overwhelming response was for a friend to listen, hold our hands and learn about the disease so our kids feel like other kids – not isolated because they never get invited to anyone’s house or other functions. Thanks to all the moms and dads out there that contributed to this list. And to the friend that started the conversation, because she was being all of the things that we mentioned here: a good friend! Andrea, thanks. Previous Post What’s in your Easter Basket?